The History Of "The Day Of The Dead" Is Very Interesting. Woman Performed Surgery On Butterfly With Broken Wing, Next Day It Surprised Her. 25 Random Photos We Bet You Haven't Seen Before. Don't you just love the Internet? All you have to do is type something on a search engine, and voila! Instant image! Photos speak volumes and give us an amazing insight into things we probably never even knew existed in the world. So, here are a couple of photos that will give you a whole new perspective on what the world really looks like. And what you see will change the way you look at everything around you. #1. Calling this sea slug by its true scientific name, Elysia Chlorotica, can be a serious tongue twister. But this “plantimal” is truly worth staring at for several hours. It may not be a leaf, but it’s got all the qualities of one. Believe it or not, this sea slug has the ability to photosynthesize like an actual plant. Mind blown! #2. The next time you’re at the grocery store, make sure and check the change the cashier gives you. You might be walking around with a dime that’s 104 years old and not even know it. Owning such an interesting coin is amazing. Plus, imagine how much this coin would be worth to an avid coin collector. You could turn a dime into some serious cash. #3. Rome, Italy is known for having some narrow streets, which makes it difficult to drive a UPS truck. Fortunately, UPS found a way around that. Instead of driving a truck, UPS uses a bicycle truck to deliver their packages through the narrow corridors in Rome. Now that’s pretty clever, and the UPS driver’s legs must be ripped. #4. There’s a 2D world beyond that which is known to humanity, and you can probably find it in Chinatown. Where else would you expect to find a 2D cartoon looking purse? It’s kind of sweet to walk around with one of these around your arm. Everyone will be turning their heads trying to figure out how you managed to bring a 2D object into a 3D world. #5. This manhole cover in Germany looks like a gateway into another dimension or a dark dungeon. A part of us dreads to think what could be lurking down there. But curiosity would make most of us investigate. But if we start to hear the sounds of ghouls or zombies, then we’ll just stay right where we are and send someone else instead. #6. Most buildings get a paint job to give it a brand-new look, but this one has leaves that change colors. Think of it as a seasonal building. When the seasons change, so do the colors of the leaves. That’s pretty neat. It’s so colorful too, like the beak of a Toucan bird. And you can take a look for yourself. It’s the National Museum in Wroclaw in Poland. #7. In Hamburg, Germany, you have a completely cool way of ordering your food from McDonald’s. You can either walk in, drive-thru with your car, or drive-thru with your boat. We’re guessing there are a lot of Germans in Hamburg who prefer to hop on boats instead of cars. Never let it be said that McDonald’s doesn’t go above and beyond to ensure great quality service. #8. This tulip is so rare because one of its leaves has actually become a hybridized version of a petal. There are weather elements that might play a role in a tulip developing leaf-like qualities within a flower where petals should be. Sometimes, the process can happen in reverse, and the flower will develop petal-like qualities. #9. The only thing more breathtaking than seeing an actual ghost ship is seeing one that’s been handmade. Look at all the intricate detail. We doubt that an actual ghost ship could look this good. But it’s such a good thing that no one has to clean this thing. The cobwebs and dust would only help to enhance the look. #10. This Uber driver’s hair has formed a perfect 25, but is that his age, or something far more sinister? Maybe the number represents the number of people he’s iced with his bad driving. But to be on the safe side, we’d probably get out of the car before we end up being number 26. You just never know these days. #11. Someone found a penny with a Mason symbol on it, but the question is, whether it’s legit or not. There are a lot of fake Masonic symbols out there. Some of them were used to christen buildings in the US. Sometimes, it’s found on coins. But not all of them are legit. If you look closely, you’ll notice the symbol goes into Lincoln’s chin, which would never happen in a real coin. #12. If you thought taxes in the US were bad, wait until you see where this Australian guy’s tax money went. It’s too bad it’s illegal to not do your taxes. Otherwise, most people would choose that option and save some money for a rainy day, like if they find themselves unemployed, or in need of money for their retirement. #13. Ben and Jerry’s discontinued some of their flavors over the years, but they will never be forgotten here. There’s an actual cemetery dedicated to discontinued flavors at Ben and Jerry’s. But believe it or not, you can probably go to their website and request that they resurrect an old flavor. Who knows? With enough votes, they can necromance that flavor back to life. #14. Construction barriers in the western world are so dull and boring, but totally cool in the land of the east. This is incredibly cute! If you go to Tokyo, you might find construction barriers in the form of “Hello Kitty.” But we’re not surprised. Hello Kitty in Japan is as insanely popular as Spongebob Squarepants in the US. #15. No, it’s not an Imperial Walker from Star Wars, but it is a Trojan Horse made up of computer parts. This technological monstrosity sure puts a new spin on recycling technology. But who would dare try “rebooting” this techno-horse? Not us! It has tons of slots that you can fill up, or you can just admire the masterpiece if you ever visit the Tel Aviv University, where it’s displayed. #16. You might wind up creating a nebula the next time you put your make-up bag down somewhere. It looks like a freaking Aurora Borealis, but it’s not in the night sky. It’s right in this person’s home. Somehow, when the light hit this bag, it refracted it, causing a phenomenon that’s worth a snap or two. #17. This brick is 100 years old and so are the finger marks left behind by the person who put it there. Talk about leaving a mark behind! Who knows who the person was that lay these bricks. But maybe someone can call the FBI and have them run a fingerprint analysis. It might be cool to learn the person’s name. #18. You might want to check under your potted plants once in a while to see what’s growing under it. There’s a good chance that while you’ve gone about your day as if nothing was wrong, something insidious was growing in your home. When this person moved their plant, they noticed that an entire root system had grown under it. #19. This Ghanaian couple have just gotten hitched, and they look like royalty sitting in their vast thrones. We simply love the color of the clothing on the groom and bride. It’s much more colorful and vibrant than a conventional black and white tux or white gown. #20. This is the kind of hotel that they should have used for “American Horror Story: Hotel” in season 5. Before it was a hotel, it was a prison. So, imagine all the ghosts that are probably lurking in each room. This is one hotel where you can check in, but can never check out until you’ve served your time, or paid your dues at the lobby. #21. Ketchup, you either love it or you don’t, but would you actually ever consider eating it for dessert? You’ll be totally blown away by the fact that ice cream now comes in a ketchup flavor. We already threw up in our mouths a little. Did you? But hey! If you really love ketchup this much, then go ahead and serve yourself two or three scoops. Just don’t offer any to the rest of us. #22. This incredible discovery will have you believing that trees have a nucleus in the center of its trunk. It turns out that it’s a golf ball inside the log. When this person cut the wood, they found something that didn't quite belong there. But if you’re curious to know how long it’s been there, just count the rings, like you would a regular tree trunk. Our guess is, it’s been there for a year. #23. 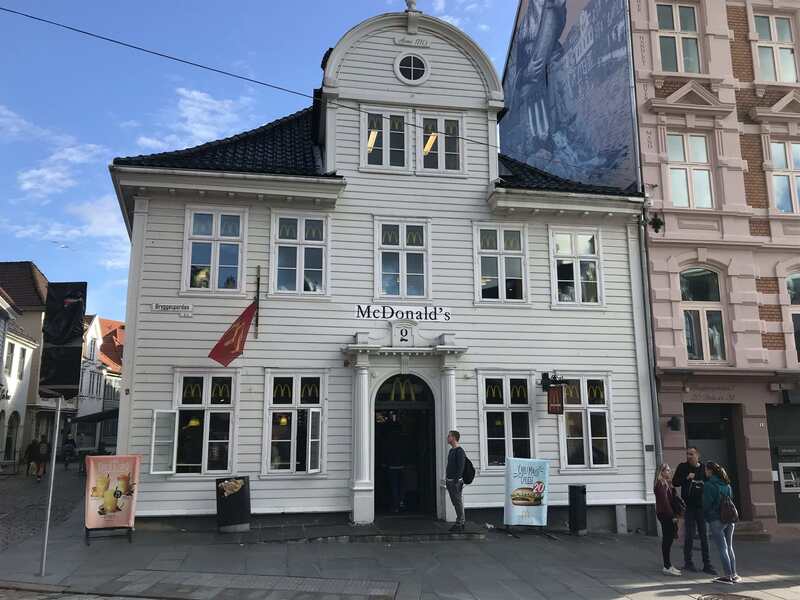 You could literally walk right past this McDonald’s restaurant in Bergen, Norway and not realize it. It looks like a freaking courthouse! If it weren’t for the flag with the golden arches, or the signs outside, most tourists would probably miss the fact that there’s a McD’s in Norway. But we kind of like that they’ve thought outside the box here. #24. Everyone knows they need to be quiet at a library, but this university is really taking things seriously. This university has some sort of library police. But don’t worry. No one will know if you snitched on a chronic talker or cougher. You can send a text anonymously and the library police will come and shut the person up. #25. We all know that mood rings change color, but have you ever heard of a black cat changing colors too? It’s got such cute short legs, and yet, that’s not what makes this cat so interesting. It’s the fact that this black cat is turning a different color. Since it’s a black cat, it probably belongs to a witch. So naturally, it would have some magic of its own.